When it was suggested that I do an interview with Applied Kinesiology practitioner and instructor, Dr. Eugene Charles, I was hesitant to accept the assignment. Of all the well known chiropractic techniques, Applied Kinesiology (AK) was the one in which I had the least interest. Throughout the years I had seen numerous demonstrations of what had been represented to be A.K., and to be very candid, I was not favorably impressed. The various demonstrations I had seen gave the impression AK was a magic act with “sleight of hand tricks” as one might see performed by an illusionist in a Las Vegas show. When I voiced this opinion of AK as my reason for refusing the project, I was offered a DVD of one of Dr. Charles lectures to see if it might change my mind. I agreed to watch the DVD and I am really glad I did. Dr. Charles impressed me right from the beginning. I quickly learned that my negative impression of AK was based on misrepresentations, or at least incomplete representations of what AK really is. In spite of being favorably impressed by Dr. Eugene Charles and his obvious expertise. I was still reluctant to do the interview with him because I realized that my lack of knowledge of what I had come to realize is a complex, multi-faceted subject, would not allow me to have an intelligent conversation with him. It was then suggested that I review Applied Kinesiology In Clinical Practice, a 100 Hour AK certification course taught by Dr. Eugene Charles in a series of DVDs complete with accompanying text books. How could I refuse that offer? The plan was for me to simply skim the course, but I quickly found myself engrossed in it. I really enjoyed Dr. Charles’ teaching style as well as the content of the course. AK proved to be much more than I ever thought it to be. Instead of skimming, I began to seriously study the course, viewing the DVDs and the text books over and over. I now recognize that AK has great value and I regret that I was previously so dismissive of it. This my interview with my friend and esteemed colleague, Dr. Eugene Charles. Koch: Eugene, how long have you been teaching Applied Kinesiology? Charles: More than half my life. I began teaching in 1986, tutoring students. When I attained my Diplomate in Applied Kinesiology (DIBAK) I began teaching a 50 Hour Course at The Los Angeles College of Chiropractic. Then I moved to New York and started teaching the 100 Hour Course in Manhattan and also upstate near The New York College of Chiropractic. I have taught this course twenty five times. These are the seminars that are on the DVDs you have been watching. Koch: That explains why your teaching style is so polished. You’ve had a lot of experience. I have only worked my way through a portion of your 100 hour course, but I am hooked. I am also pissed off that I didn’t find out what AK was really about years ago. The only thing I can say is that when the student is ready, the teacher will appear. Koch: It really is a shame. I hope that this interview will inspire the young DCs, and perhaps even those who are skeptics like I was, to take a good look at your course. Not everyone will be willing to do the work, but those who do will be well rewarded for their efforts. Charles: You are right Bill. It takes someone who is highly motivated and disciplined. The last thing I want is to see anyone just “dabble” in AK. I want to teach those doctors who want to be great healers. 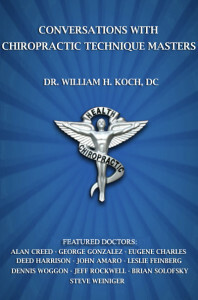 Koch: I love something you say in the course: “No one talks about Alexander the mediocre or Catherine the ordinary.” I made a pact with myself while a student: to be the best chiropractor I can be, and never settle for anything less than giving my patients the best care possible. Charles: I made the same pact with myself. I was fortunate enough to meet Dr. George Goodheart, the founder of Applied Kinesiology, when I was still in Chiropractic school. When I saw what he could do, I said, “I have to learn to do that.” I was privileged to study with him for many years. As a result, I have not practiced a single day without the benefit of AK. I wouldn’t know what to do if I didn’t have the tools that AK gives us. Koch: I can understand why you say that now that I know what the scope of AK encompasses. Prior to the 100 hour course, I associated it only with the muscle testing, and that wasn’t put in proper context. Now I know that there is so much more and that it dramatically expands our ability to functionally examine our patients in a highly evolved, systemic and systematic manner. For me it fills in gaps I didn’t even know I had. It allows us, as you say, “to make sense of what heretofore has been senseless.” Eugene, please give our readers your definition of AK, because it really says a lot. Charles: Applied Kinesiology can be defined as the clinical application of the study of movement and function. It is functional neurology. It is diagnostic of the body’s central integrative state through the detection of direct or reflex manifestations within the structure or function of the muscular system. Koch: That covers a lot of ground, Eugene. I think it would be helpful to enumerate the functional aberrations that AK identifies and the corrective procedures used to address them. Charles: Good idea, Bill. The functional aberrations AK identifies are: Muscular, Neurological, Vascular, Osseous, Lymphatic, Respiratory, Digestive, Endocrine, Acupuncture/Meridian systems. The corrective procedures used to induce or restore individual normal function include but are not limited to: a wide variety of chiropractic techniques including manual adjustments, instrument adjustments using the ArthroStim® and VibraCussor® adjusting instruments and SOT blocking, cranial techniques, therapeutic massage, reflex therapies, acupuncture, exercises and stretches, nutritional supplementation, emotional support or modalities and lifestyle changes. These are done with the aim of decreasing noxious stimuli below threshold and allowing the body to heal itself. Koch: There is no question that if we examine our patients to detect all of the possible aberrations of function you listed and then employ the corrective procedures as specifically indicated by therapy localization, muscle testing, postural analysis and challenges, we will be providing our patients with a very high level of care. Charles: We are on the same wavelength, Bill. I believe that while being proficient in effective techniques is very important, we should not strive to just be good technicians but true physicians. The technician loves the technology, the physician loves the patient. Koch: Yes! I believe that our first priority should always be on what is best for the patient. Charles: I think of what we do as a healing martial art, and we are the healing Jedi of the 21st Century. Koch: I love that analogy, Eugene. “May the force be with you.” At the risk of sounding like a salesman for your course, I must say that I consider it a great value. When you consider the fact that most weekend seminars give you only 12 hours of CE credit, this course can provide 100 hours of CE without the cost of travel and time out of the office. I really like the DVD format because it allows you to review the material as often as necessary while providing a permanent reference library. Charles: Thanks Bill. That is why I decided to do a DVD program. It could easily take 3 years to get the information in this course.